Local chefs will participate in Saborea, showing off their culinary skills. The 10th edition of Puerto Rico’s longest-running culinary fest, Saborea, will take place in San Juan, May 18-21, Clarisa Jiménez, president of the entity that organizes the event, the Puerto Rico Hotel and Tourism Association. “Gastronomic tourism has acquired a fundamental role in the promotion and marketing of destinations. It is also responsible for opportunities to enhance and diversify tourism, by promoting local economic development,” she said. “With Saborea Puerto Rico, 10 years ago, we began the important journey of capitalizing on a niche so important to promote Puerto Rico, and today we see very favorable results because it is without a doubt the largest gastronomic festival in the region,” she said. 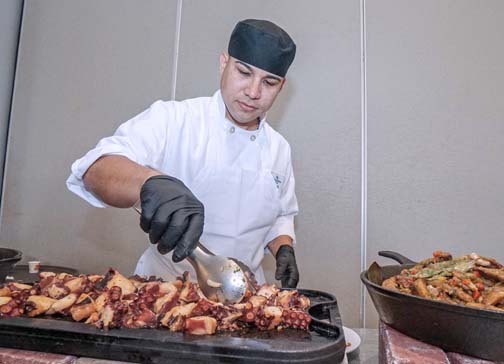 The Saborea culinary fest includes a number of activities, including the “Bubbles and Bites” event on May 18 at the Sheraton Convention Center Hotel. A private dinner is slated for May 19 at the Condado Plaza Hilton. Then, on May 20-21 more than 70 local restaurants will showcase their signature dishes, desserts, coffee, wines, beers and liquors at the Tasting Pavilion set up at an oceanfront bluff at the Escambrón beach in San Juan. A demo kitchen will also be set up, giving local and invited chefs a platform to demonstrate their skills. An after party will take place Saturday from 6 p.m. to 8 p.m. on Saturday night, sponsored by the Sheraton’s Casino Metro. As an additional initiative, this year’s 10th anniversary edition will include a special tasting and demonstration session for participants from various nonprofit organizations and students. They will be able to learn for free the handling and smoking of meats, participate in a special workshop about cheeses and the use of chocolate. “At the Puerto Rico Tourism Company, we’re proud to be part of the 10th edition of Saborea Puerto Rico. During the past years, this festival has stood out as the most important culinary event in the Caribbean, which undoubtedly contributes to the island’s position as a world-class gastronomic destination,” said agency Executive Director José Izquierdo. “Our gastronomy is one of the most distinctive offerings in Puerto Rico. For us it is important to support initiatives of this type, which serve as a tool to strengthen tourism and promote the social and cultural economic development of our island,” he said. According to the first Global Report on Gastronomy Tourism published by the World Tourism Organization, 88.2 percent of destinations consider gastronomy as a strategic element to define their image and brand. The World Association of Gastronomic Tourism estimates that gastronomy generates $150 billion annually. And according to the Mintel report on global gastronomic tourism, , there are 27.3 million American tourists whose main reason to travel is to enjoy gastronomic activities, the PRHTA said. Hey Buddy!, I found this information for you: "Saborea culinary fest marks 10th anniversary May 18-21". Here is the website link: https://newsismybusiness.com/saborea-culinary-anniversary/. Thank you.